Painted in oils on canvas in the very early Victorian period, depicting The Virgin with the infant Saviour in her arms, appearing on a cloud to St. Francis, who is on one knee to take the child, with further Saints and figures surrounding her, presented in the original good quality ornate stiff leaf composition moulded gilt frame with inset slip, inscribed W. Etty RA; The Virgin & Infant Saviour with Saints; by Rubens, “The Church of St Jacques, Antwerp”, the whole surviving from the second quarter of the nineteenth century. The painting is in good overall condition. The use of light shows real dexterity as it plays upon the faces and torsos of the figures. Etty experimented with different poses, and the poise and shape of the figures here point to a keen knowledge of the human body and the use of colour is sparing but superbly effective. The reddish tones of the composition seem to crop up on several other paintings by Etty and he seemed to favour rather dark backgrounds pierced with the greens and browns of trees and the draped reds of passion. There are some very minor losses, and it perhaps could do with a clean; there is craqulure to the surface also as photographed. Verso we see the stamp of “C. DAVY ARTISTS COLOURMAN. 83 NEWMAN STREET, OXFORD ST. LONDON.” This stamp with Charles Davy at 83 Newman St dates the picture to between 1843-62 and the same stamp can also be found on a Copy after Michael Dahl, by Sir John Pratt, in the National Portrait Gallery and Edward Villers Rippingille, Mendicants of the Campagna, 1844 in the Victoria and Albert Museum). Charles Davy (1800-72) succeeded his father at 83 Newman St in 1843; his label made the claim that the business had been founded in 1795. In 1859 and 1860 Charles Davy was advertising lay figures, new and second-hand, for sale or hire (The Times 27 May 1859, 24 October 1860). In April 1862 a sale was held of his collection of more than 400 pictures by old and modern masters, together with a lay figure, easels and various picture frames (The Times 4 April 1862). He was last listed as an artists’ colourman in 1863. William Etty is York’s foremost artist and his statue has pride of place outside York Art Gallery. He was famous for his paintings of historical and mythical scenes but, in his day, Etty was also infamous for his paintings of nudes. Etty recalls in his autobiography: “My first panels, on which I drew, were the boards of my father’s shop floor; my first crayon, a farthing’s worth of white chalk”. Many believed that the splendour of Etty’s richly coloured canvases was designed to disguise his underlying preoccupation with titillating forms of bodily display. Etty was repeatedly encouraged to 'turn from his wicked ways' and make his art 'fit for decent company'. In May 1840, Etty made the trip to Brussels and Antwerp which he had been forced by revolution to abandon in 1830. He intended to study the works of Rubens, (which is how this painting obviously came to fruition) but the briefness of his tour—in the company of Betsy Etty he visited Ostend, Bruges, Antwerp, Brussels, Aachen, Cologne, Bonn and Rotterdam in the course of ten days—meant he had little time for study. The following year he returned to Antwerp and Mechelen for a longer visit to visit St. Rumbold's Cathedral and to study the substantial collections of Rubens paintings in the two cities; again this is when he would have been inspired to paint this work. On this second journey he twice visited a Trappist monastery outside Antwerp, staying overnight on one visit, and bought a Trappist habit; he also bought a Capuchin habit from a monastery in Bruges. These acquisitions prompted paintings on monastic themes over subsequent years. Despite a perceived decline in his work's quality, the 1840s were the most financially successful of Etty's career. This work would have been one of the last pictures Etty painted after his trips to Antwerp and has not been on the market for at least twenty seven years. ; last being offered at Sotheby’s London on August 27th, 1991. 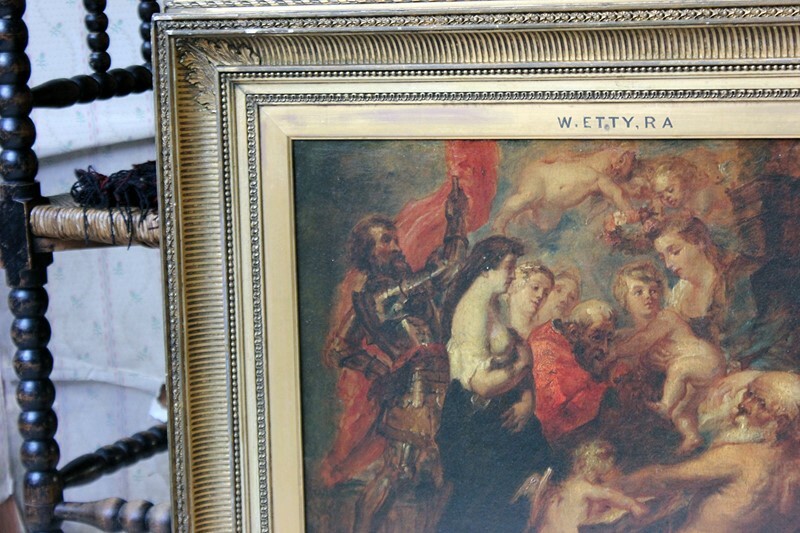 As such it is a rare opportunity to acquire a painting by a revered artist fresh to the market.